In 2015, he published another report detailing the perspectives of 61 Kansas law enforcement officers from 15 agencies. Both publications at times make clear the stark division in how police and residents experience their interactions. 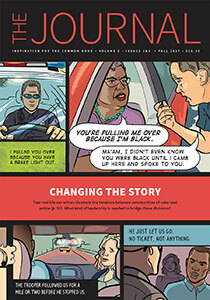 Drivers report long-term emotional distress as a result of being stopped by police. They feel singled out if the vehicles they drive are too expensive or exemplify a minority culture or travel to white neighborhoods. They think they’re often singled out for petty violations and that officers talk down to them. 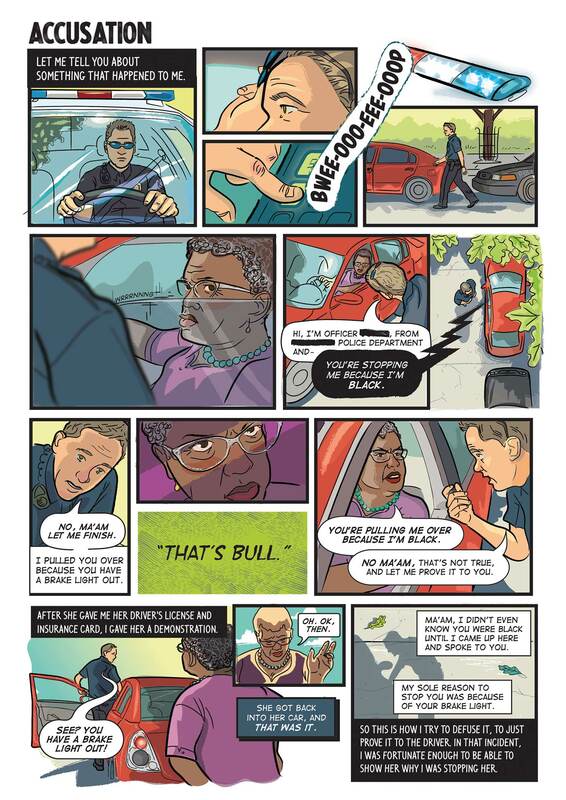 Racial profiling, especially for black men, is considered a normal part of their lives. Police officers tend to see allegations of racial profiling as a way for drivers to intimidate them into backing out of their suspicions or not giving citations (about 64 percent of the officers surveyed by Birzer indicated they had been accused of racial profiling during a motorist stop). They believe that negative views of police are driven by distrust passed down through generations in minority communities. They think the media over-reports allegations of racial profiling and often provides jaded coverage of police. For police, it’s a problem that calls for more effective communication, education and more positive interactions. 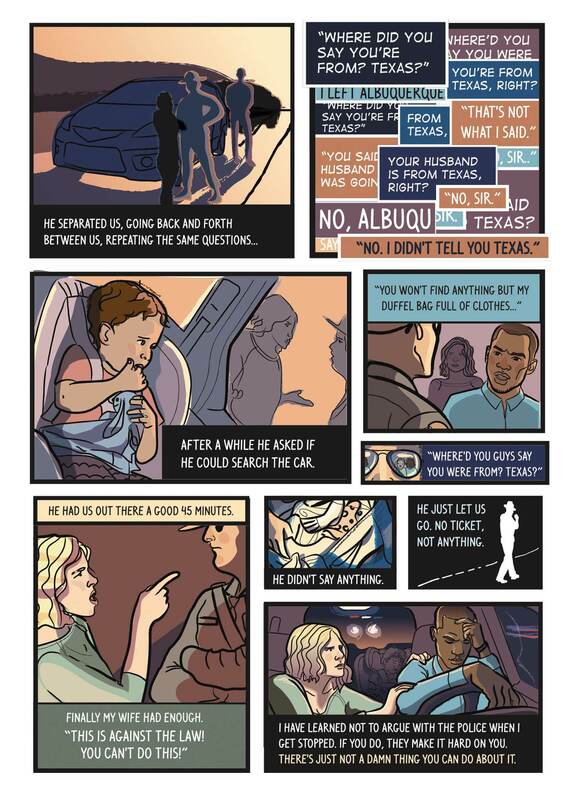 To help understand both perspectives, The Journal enlisted artist Erin DeGroot to develop illustrations summarizing two of the narratives detailed in Birzer’s research, one a police officer’s, the other a driver’s. The goal of these stories is to give readers a deeper understanding by immersing them in each viewpoint. 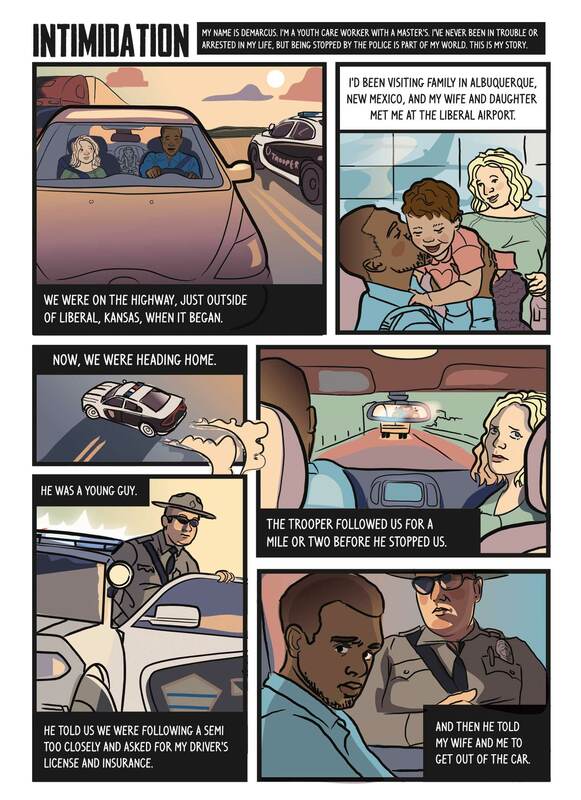 This entry was posted in Law enforcement, Race and Ethnicity and tagged Kansas, racial profiling. Bookmark the permalink.